* Mirror Polished Finish with Laser Engraved Logo. * Machined from Durable Ultra Light Aluminum. * You will be able to hit all the gears like never before. 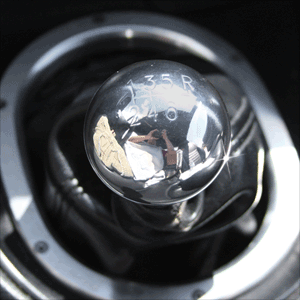 Innovative Bold Styling: Eliminate that Unsightly factory shift knob and move up to our Round Billet Shifter Knob with 6 Speed Engraving. Our Quality & Finish will leave you with a grin from ear to ear as it is the Best looking unit available for your Ford Mustang or Cobra. Quality Construction: Crafted to fit & function better than an OEM part. No one else gives you the bold clean styling of our Aftermarket Dress Ups, Suspension and Performance Parts for your American Muscle Car! All our Custom Billet Shifter Knobs come with all hardware required for a clean easy install in under five minutes for a Bold new look. Click Here for Instructions Fits these Vehicles: 2005 2006 2007 2008 2009 2010 GT Mustang Roush Saleen & Vehicles. 2005 2006 2007 2008 2009 Shelby GT500 (does not fit 2010+ GT500) Made in the USA!